Bring a little uniqueness into your dining room with an above average look for your kitchen table. Instead of going for the usual style and design, why not look for something a tad taller; perhaps counter height? You’ll need taller chairs and maybe even a room with a bit more space, but it’ll help to create a more upbeat, special and fashion-forward look to your home. Let’s take a peek, shall we at 12 counter height kitchen tables ideas and designs. This uniquely designed dining set will add warmth to your dining decor with its elegant and smooth rectangular counter height table. Just like the captain reads, this dining room set will add warmth and elegance to you dining room. It’s got a traditional and homey structure while still adding a unique touch with its above average height. Of course, beige tones and espresso wood will also create a great foundation for classic decor. If you’re looking for an outside-the-box piece for your smaller dining room or breakfast nook, look no further. 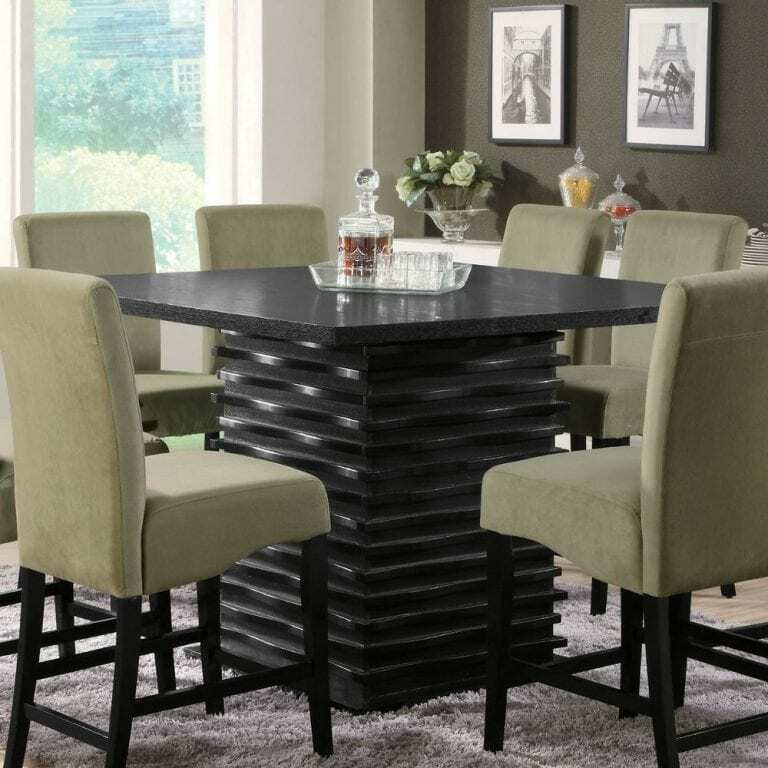 This counter height table set is constructed of birch veneers with a classy, yet edgy masculine style. It would also be the perfect arrangement for your man’s bonus room or basement, don’t you think? This is such a great set to start out your newlywed home or bachelor pad. It’s sleek, it’s clean and it can fit into almost any theme because of it’s neutral foundation and easy design. Plus, it’s a bit more youthful with the bar-height accent. This is another clean and modern design that can fit into a variety of homes and style themes from country to contemporary. Do you notice the storage in the center? Your small wine collection can fit right inside for your date nights and small dinner parties. It’s such an innovative piece! Create a unique and stunning focal point in your dining room with this five piece dining set. The oval glass table sits on top of atom shape table base finished in a gorgeous brown/cherry. One of our favorite pieces of the pack, this stunning table could be just the focus you need to transform your dining room into something a bit more special. The height makes this set unique, but the construction makes it a stylish and artistic choice for your fashion-forward home. The mix of cherry woods and glass top also gives it more interest and appeal. The Stanton collection will give your contemporary casual dining and entertainment room a bold update. With its unique wave design and different chair options, you can mix and match to create the perfect look for your home. Contemporary with an Asian appeal, bring in some sophistication and culture with this dining room set from the Stanton collection. It’s bold and chunky, great for rooms with a bit of extra space but also subtle in its design. We love how it creates an artistic flair right in the center of the room with its waving accents. Alive with an exciting Arts & Crafts flair, the contemporary style of Ameillia Collection by Homelegance uses smooth medium brown Finish and clean line design to create an inviting atmosphere to enhance your dining experience. This is another great option for your small and quaint breakfast nook or sit-in kitchen area. It’s got a contemporary style with a traditional finish that can fit into nearly any space with a simple ease. It will help to create the perfect spot for early morning coffee and comfortable after school snacks and homework breaks. A dining room set with these tones and slender legs was made for a home with modern style. It’s big but not bulky, fitting easily into a variety of sized dining rooms and the height gives it a bit more interest than if it were a standard size piece. Of course, it may be too casual for your formal dining area, but it’s definitely easy to dress it up. At the Crossroads. Discover the place where traditional elegance meets cool contemporary with the sophisticated Americana II counter-height collection dinette. This is another great option for a traditional, sophisticated and chic kitchen table. It’s also another great option if you’re looking for a piece that will blend in with a variety of different home style’s from contemporary to completely rustic and traditional. high on eco. Sustainable, plantation-grown solid mango wood protected with eco water-based finish niches on high into industrial iron frame with antiqued zinc finish. A sustainable, plantation-grown mango wood made these beautiful pieces happen. They are completely fashion-forward and trendy in style. We love its hipster vibe and “coffee shop” feel. We also love its color and how easy it would be to compliment and accent it with fun patterns and decor. Merging sleek design with superb kitchen functionality, our counter-height table and stools are a must for smaller spaces. If you’re really tight on space, you may want something more in this lane. It acts not only as a great breakfast bar but an easy island for dinner prep and cookie decorating as well! It even has a bit of drawer storage to help organize your smaller space. Probably the most traditional and masculine dining set of the entire list, this piece was made for a classic home with classic tastes. It’s dark wood gives off a welcoming and cozy spirit and the storage in the middle will help hide the table linens and entertaining necessities that you don’t use everyday.